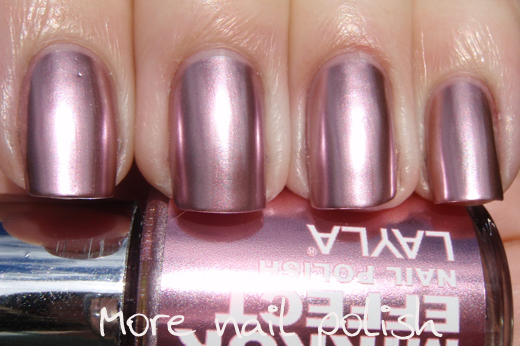 I was really excited when I saw the promo video for the new Layla Mirror Effect polishes. I knew I had to get them all because I'm a real sucker for anything shiny. And boy, are these polishes shiny. Today I'm showing the first four polishes in the collection. Formula and application on all of these was the same so I will put all that info together at the bottom. I feel my photos don't do these justice. It didn't seem to matter if I photographed in the shade or the sun, I just couldn't make them look as reflective as they do in person. I think it might be because the photos are so up close. I did take one of Metal Chrome a bit further away and I think it shows the shine the best to how they look in real life. Metal Chrome - Silver, uber shiny metallic chrome. 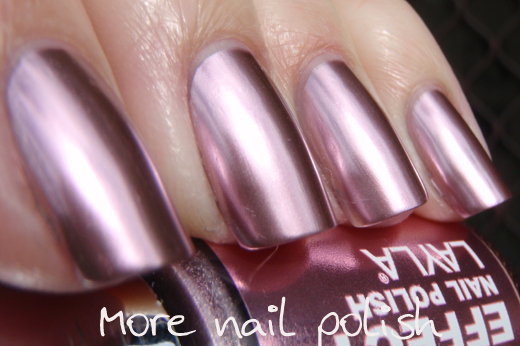 Cosmo Lilac - light mauve pink, reflective metallic chrome. Titanium Sky - Blue metallic chrome. All these swatches show two coats, with no base coat or top. You could get away with one careful thicker coat, but two thin coats worked better for me. I also buffed my nails using the Layla buffing file. I did try one nail without buffing and these polishes REALLY show every single bump, dot, indent, ridge or imperfection on your nail. I also tried these using both Aqua base and Seche Vite as a base coat because they both have a very smooth finish. Both worked well and I 100% recommend wearing either Aqua base coat, or a very shiny top coat as your base if you are not going to buff your nails. But because I was swatching, I didn't want to waste time doing base coats for each one, so I just buffed to a shine and painted naked nails. Application of these polishes reminded me of the Layla holographics, in that when you first apply the polish it looks dull and rather matte finish. 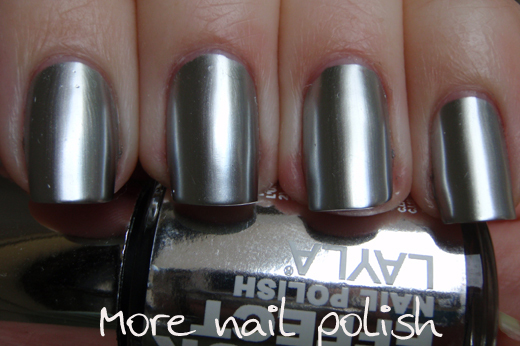 In fact after my first few nails I was like "what is this crap chrome". But then as they dry you can actually see the chrome effect shine coming in. For me these are very different to other chromes I own such as China Glaze 2030 and some Revlon and Sally Hanson ones. Those polishes appear chrome from the moment you apply them and you can still see slight brush marks, but these ones dried to a shiny, smooth, brush free finish. I also applied Seche Vite top coat when I was doing my initial test. I applied just a half nail of top coat to compare and see if it dulled the effect. 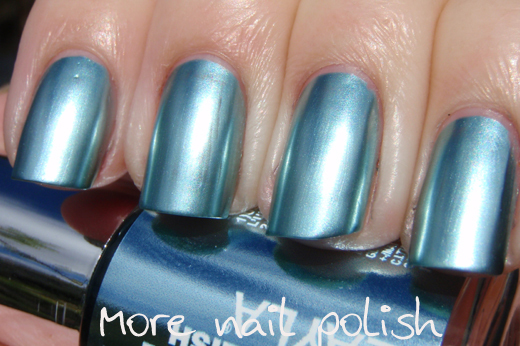 I did find it made the mirror effect less mirror like and a little fuzzy, so I swatched without top coat. I have yet to wear any of these as a mani, but I'm about to put one on now to wear this weekend. So I will report back as to what the wear is like. I've also tried them for stamping, but I will save that for another post. First impression. EPIC WIN. Outstanding job from Layla to release another awesome collection back to back with the recent awesome holographics. I've been waiting to see if those really worth the money! 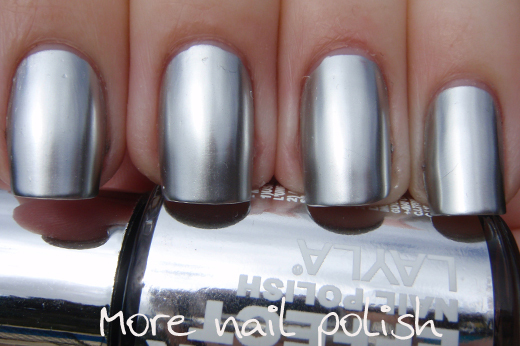 They seem pretty amazing, I just don't get how are they different than any other metallic-finish nail polish. I will do some comparison swatches for you comparing these with my other Chromes and foil polishes. Its really hard to show how mirror like they are. Not quite like Minx nails, but certainly the closest I've seen in a polish. Superbly smooth finish on these - love them. OHMYGOD, those are so amazing! So beautifully un-brush-strokey (which is totally a word..)!! 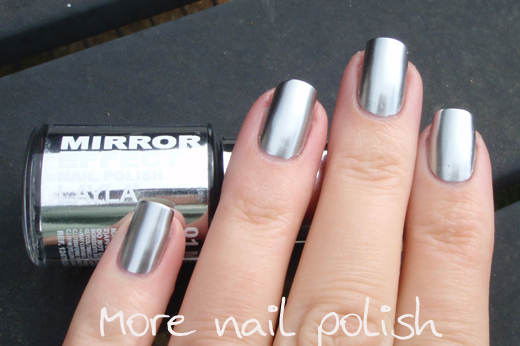 Have you seen/tried the Maybelline Mirror Effect polish? How do you think it compares? I have seen swatches of Maybelline Mirror Image, but I don't own it. They look very similar to me, but the best part is these Laylas come in eight colours. These look amazing, and I can't see a brushstroke at all! Did you buy locally? I placed a group order for any Aussies wanting Layla polishes directly with Layla Cosmetics in Milan Italy. They FedEx the box and we got it in less than a week. I signed up to the Layla site before it required the TAX ID. I'd had a lot of people email me about that. I've seen on Faceback they say to email info@laylacosmetics.it if you have any trouble. At the Layla site just put in zeros for the tax id. Worked for me. But with international shipping it came to $74 for two bottles. Not sure I love this color that much! Wow, what awesome shininess, no brush strokes, have to get my hands on one..or two! Need! I love that there are NO brushstrokes! I hope they made their way down to Oz soon! 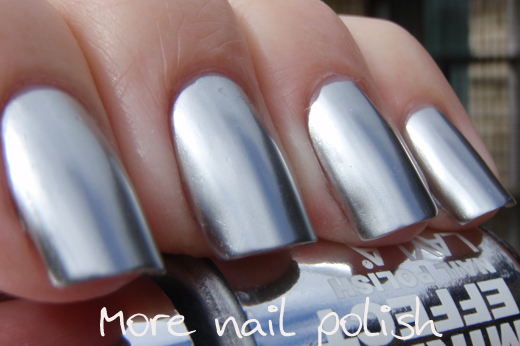 The magnetic polish is everywhere now. wow!!! I loved this collection....so pretty. wow these seem like a total win! I LOVE the silver and the blue one! How do these compare to Stargazer metallics? If you have any of those. Sorry, I don't have any Stargazer metallics. Nihrida has done an excellent comparison post with Stargazer and Maybelline chromes, and I think these would be similar, except with basically zero bush marks. Amazing is the word! 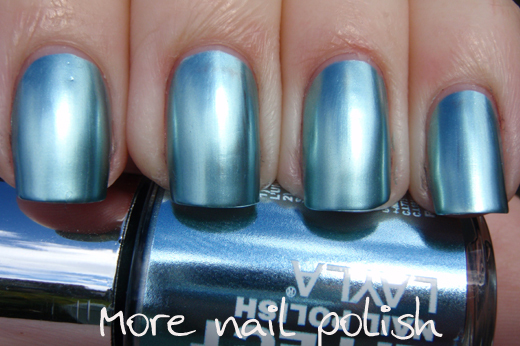 It's hard to believe that it's even possible to make a nail polish so mirror-ish! Gorgeousness! Mine came today thank you! Will need at least a couple of these. And since I'm here... I warn you: prepare yourself because 8 new holo shades are coming from Layla!!! And they look amazing! I know, I'm so excited about the new Layla holos too! Some of the colours look amazing. I just hope they are strong rich colours, and not pastel. I ACTUALLY CAN'T WAIT FOR THESE. My old SH are actuallly at their last drop and I have been WAITING AND WAITING for a company to put out a LEGITIMATE (not foil) chrome collection!!!!! I cant waiiiit!!!! Thank you hank you thank you !!!!! I feel I've been waiting for ages for a true chrome collection too. Am very excited to have them. I just have Seche Vite fast drying top coat, and I used that as the base coat. I used it because it has a very shiny finish and great leveling properties, because it finishes shiny and smooth it makes a good base for both these mirror polishes and the Layla holos. Yeah, for you US gals that are used to cheap polish, they Layla's would seem expensive. But here in Australia, where OPI retails for $20 and Revlon for $15, they Layla's don't seem too expensive. Como me gustan los esmaltes metalizados, son divinos. Mis favoritos de los que posteaste el Metal chrome y el Titanium sky, son una locura. After that I put them in my wishlist. These look amazing! I'm always on the lookout for a good chrome - I don't think you get this brand in the UK though. Shame! It will take them a while to be instore here in Australia, but you can always just order directly with Layla in Milan Italy. That's how I got these! WOW so shiny! I love them! Wow, Layla is really bringing it! Magnetics, Holos, and now Chromes, too! Awesome! These look flawless. I wonder how they would look mixed with some spectraflair. Have you ever tried mixing a chrome with sf? Wow, the finish is so smooth! I'm impressed. Thank you for these swatches. Initially I didn't think I'd want any of these 'cause I do own a few chrome finish polishes, but now I think I'll need a couple. 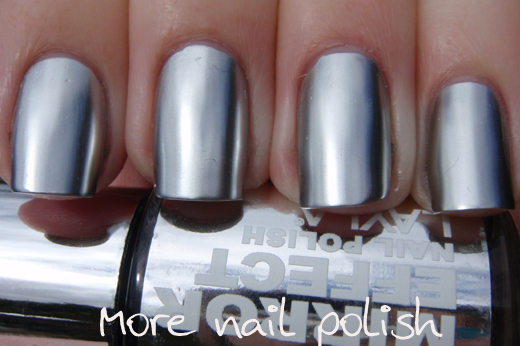 i think i never saw chrome polish with such foil effect. Lovely:). Where do you order your Laylas from? Those are some awesome colours! Where can you buy these? Layly = Awesome. 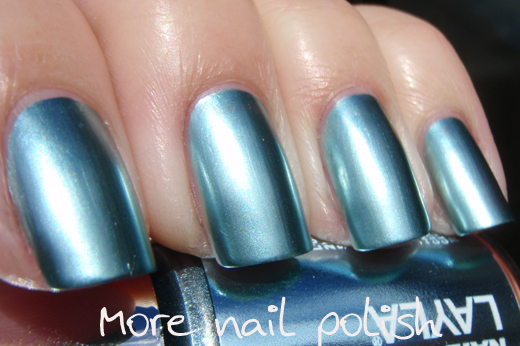 I love their holos. And I love metallics. I think I am going to need these! Your swatches ate beautiful! Greetings - I am truly a maybelline mirror image woman. I have about 8 and it is the only color I wear. Got them back when they were sold at the dollar store! Many many moons ago. I am so interested in trying the Layla Metal Chrome. How can I get my hands on one to try. Greetings - I am definately a Maybelline Mirror Image woman. I think I have about 8 left that were sold many many moons ago. 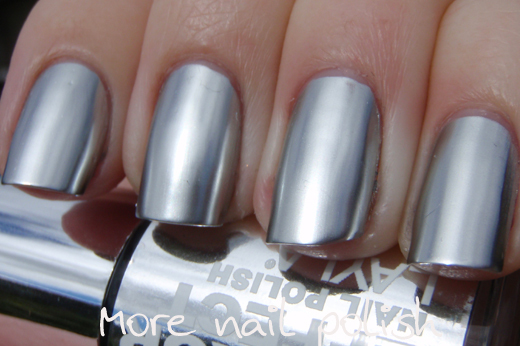 Anyways I am so interested in trying the Layla Metal Chrome in Silver. Please make me aware of how I can get my hands on this. I really would like to compare the two. I would consider myself an expert when it comes to Maybelline mirror image. Just interested in how they compare. Wow, chromes without visible brushstrokes = LOVE!